Abstract: Already holding the speed crown, AMD decided to "one up" Intel once more with the release of the AthlonXP 2000+ CPU. Already holding the speed crown, AMD decided to "one up" Intel once more with the release of the AthlonXP 2000+ CPU. With the XP2000+ retailing for approx. $540 and the Pentium4 2.0 GHz for around $830, we weren't too happy to have to buy one these P4's for this review, but, it's all in the name of testing, so let the dual begin! The AthlonXP processor incorporates quite a few new "features" that it's older brother the Athlon doesn't have. Most notably the Quanti-Speed Architecture. What exactly is Quanti-Speed you ask? Well, first off it's really more of a marketing ploy then anything else, and essentially says that "our CPU's do more work per clock cycle, so MHz means nothing now." Still, there are some true enhancements from the Athlon core. Probably the biggest enhancement was the inclusion of Intel's SSE technology . Yes, that's the same technology which is inside every Pentium III processor. 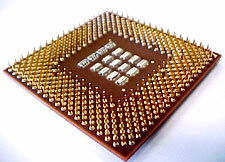 Streaming SIMD (Single Instruction Multiple Data) Extensions were also added to allow the Athlon XP processors to handle multiple data calculations at one time. Still, with all this great technology, it's only really useful if the software programmers code for it. Fortunately for AMD, SSE has been around for quite some time now, so there are quite a few pieces of professional software already using it. Not surprisingly AMD chose to call it 3DNow! Professional rather than SSE. Next in the line of additions to the Athlon XP is hardware prefetch, which is built into the "Palomino" core (AthlonXP and AthlonMP). What hardware prefetch does is look at what the user is doing and try to extrapolate what piece of data is going to be used next. The processor stores that prefetched data in the L1 data cache, thereby increasing the speed of calculations when that data is needed. If it turns out to be wrong, it willl simply flush the cache and get the data that's actually required. While this is not part of the Quanti-Speed Architecture, one very significant addition the XP has is the inclusion of a internal thermal diode. This isn't anything new to Intel dies, which have had the benefits of internal thermal diode's since the Pentium II 'Deschutes' core. Like Intel, AMD seems to be having a hard time getting motherboard manufacturers to read the temperatures from the internal diode rather than an external one however. Until the manufacturers start to follow through on this, the horror stories of burnt-out processors will continue to be heard. When AMD introduced the Athlon XP on the OPGA (organic pin grid array) substrate they alleviated many of the problems seen by some Athlon and Duron owners (overzealous heatsink application could crack the processor in two). The move to fiberglass packaging made allowances for some flexing during heatsink installation and also improved processor performance by lowering impedance. The Athlon XP follows in this tradition, and for the moment, the substrate is still brown. Expect to start seeing the green Athlon XP's by May or June of this year. Almost each and every company that manufactures processors has been trying to find ways of educating the consumer about the dangers of relying entirely upon the "MHz Myth." This started with Transmeta and their Crusoe processor, and AMD has recently embraced this mantra. As far as AMD is concerned, ever since the introduction of Intel's Pentium4 line of processors, you could no longer compare Intel MHz directly to AMD MHz. This discrepancy arose because the Pentium 4 has longer pipelines which allow the Pentium4 to scale significantly higher then it's competition. AMD has since started the True Performance Initiative (TPI). This has received mixed reviews from consumers who often see the XP model numbers as an attempt to be misleading, but this really isn't the case. What the XP model numbers are trying to communicate is the relative application performance. The real goal is base "performance" ratings on IPC (Instructions executed Per Clock cycle) x MHz = TPI. AMD has been working with many larger OEM's such as Compaq, HP and Sony to try and create a appropriate performance rating system. But for the moment, this quote from the AMD Athlon XP FAQ explains it best: "The AMD Athlon XP processor 1900+ will outperform an Intel Pentium 4 processor operating at 1.9GHz...." The Athlon XP 2000+ by the way, operates at a frequency 1.67 GHz. Even though AMD produces some of the most powerful x86 based processors, they're still preceded with the reputations of the K6, K6-2, K6-III based processors of being slow and full of compatibility problems. This just isn't the case for the Athlon based CPU's, in fact they're quite a bit more powerful then their Intel counterparts! Long gone are the days of lousy 3D gaming/professional performance, now they're the king of the hill with the Athlon based CPU's. One nice thing is that AMD unlike intel, has never locked the multiplier of their CPU's so the enthusiasts have always been able to push their CPU's to the fullest. Sure changing the multiplier is more difficult then before, and it would probably deter those amature's overclockers who would possibly ruin their CPU's, but it's still possible to adjust them! It just takes a little more work.